Why are Online Job Services so Popular? 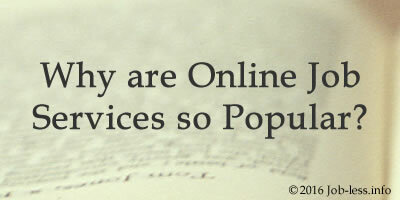 Article #4: Why are Online Job Services so Popular? It is not a piece of news anymore that our life can be imagined without internet. We buy food and clothes there, we get to know the latest news from there, we make friends there, we practically live? on the net! And we use it for job searching, of course. Online job services are becoming more and more popular nowadays and more and more people trust them. We will try to find out why. Online job services are good and useful for those who look for a job as well as for those who look for good professionals. Employers have a chance to choose among workers all over the world and they also have a chance to look through the portfolios of the would-be employees and discuss all the details about a project. And, there is one more not less important point for the employers - they always have a chance to pay less directly to a person than pay much more to an agency. Payment methods online job services provide their clients with are convenient for both employers and employees as these methods make the risks of cheating minimal. The employers always have a chance to check the work and then pay, if everything is fine and they are satisfied with the results. The employees are also safe there - the services of milestones and the job agreement created and accepted by an employer lessen the risk of cheating. When you use online job services to find a job and earn money there, the whole world is in front of you and it doesn't really matter where you and your employer live! Isn't it great? It gives you a chance to get extra money doing some extra work at home. Some people choose to rely on internet work only and they make good money. There is one more very important advantage of working online - you can have your own working hours and your own schedule. It is not a secret that some people prefer working during the day and some of them prefer working at night. Have your boss ever let you work at night? You don't have to spend eight or nine hours at your working place anymore, hating and cursing it! You can find the work to your liking and work with inspiration and desire. The results of such work are much better and you get paid better for it. When you start working online, you get more disciplined as you commit to your employers and the better you do the job, the better feedback you will get, you will create better and so you will have more opportunities to be chosen again. The career can be built online as well! Start using online job services and get the best of them!